Posh boss Graham Westley has been forced into making several team changes in recent matches. Photo: Joe Dent/theposh.com. Peterborough United manager Graham Westley has issued a passionate defence of his selection policy. The Posh boss has come under fire in some quarters for constantly chopping and changing his starting line-up. Posh centre-back Jack Baldwin is getting back to his best form after a lengthy absence through injury. Photo: Joe Dent/theposh.com. 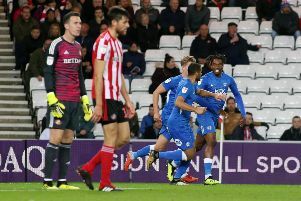 Posh have not named an unchanged side since the League One goal-less draw with Southend United at the ABAX Stadium on January 16. There have been at least four changes to the starting line-up in each of the last six matches. But Westley insists many of those changes have been forced. He cites injuries and suspensions, and revealed that he uses scientific data to analyse a player’s fitness and form. Westley has now urged fans to see the ‘bigger picture’ as he plots a path for Posh to regain their Championship place. The Posh boss has been using recent matches to give valuable experience to the likes of Jordan Nicholson, Callum Chettle, Aaron Williams and Leo Da Silva Lopes. “A lot of our team changes have been forced,” Westley stated. “There have been times when we’ve had up to eight players missing from the team that won six games in a row earlier in the season through suspensions and injuries. “Alnwick, Smith, Elder, Bostwick, Baldwin, Zakuani, Forrester, Taylor, Angol, Santos and Beautymana have all been absent for periods of time during our difficult run and no team could reasonably expect to keep on winning with so many first-choice players missing. “Cristiano Ronaldo said Real Madrid were a much weaker team when Benzema and Bale didn’t play so absences affect the best teams in the world. “What people outside the club perhaps don’t realise is the amount of scientific data we use. I will have data feeds that tell me a certain player isn’t covering the same amount of ground as normal, that his heart rate is too high, that his energy levels are low. That sort of information has to become part of the selection process and it would be bad management to pick a player who I know is not at his best physically. “Arsene Wenger said he might have damaged Arsenal’s Premier League title chances by trusting Alexis Sanchez when he said he was fit rather than take note of the science which said he probably wouldn’t be. “I have also had players like Jack Baldwin and Gaby Zakuani coming back from very long injuries. “It’s very difficult to play back-to-back games to a consistently high standard when you’ve been out for so long. “Jack and Gaby have been getting through games because of their professionalism, experience and attitude, but expecting them to be back to their best fitness-wise straight away is unrealistic. “Both are getting there though which is great for us. “There is a bigger picture here as I’ve taken the opportunty to blood young players in certain situations which will only make them stronger and better players for us in the future. The experience they gain now will be vital to their development. “I’m still learning about the players. A lot of new players came through the door in January and I am still assessing their qualities. I’ve given players we signed from Nuneaton and Histon a game in recent weeks.